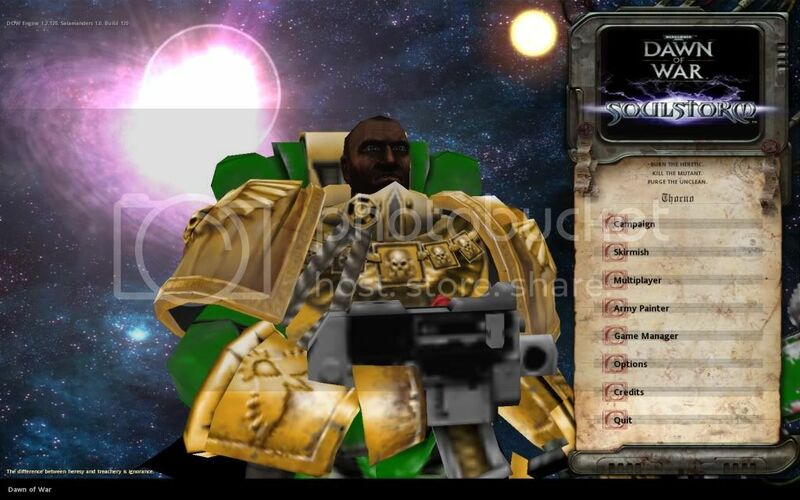 This is my first post on this forum, I dont usually ask for help but I really want to make my own Salamanders skin for Soulstorm. I tried to change the scouts skin but it came out like this in game. What causes this to happen ? Yet my first attempt at a force commander skin for the main menu worked out fine and my librarium skin works. What program and version are you using to create the scout texture and compile it back to a WTP? It looks a bit like the texture image has been mangled. I think I've seen that happen before, but I can't remember what the cause was. Other important things to check are what the layers look like if you extract them again and how your paint program is saving them (some apps invert the image by default, although I'd expect that to look broken in a different way). Well, I don't know much about skinning at the moment, but I've heard that the scout texture being non-square can cause problems with some WTP tools. It used to cause problems with Beroc's tool, but that's extremely old and unsupported now. Beroc's tool didn't support banners either, or create correct composite TGAs from WTPs, or make all of the files. The Dawn of War Texture Tool supports it all and shouldn't have a problem with any textures. I was guessing the force commander in the game would be force_commander_unit_default.wtp but it doesn't change when i edit it and put it in the folder. 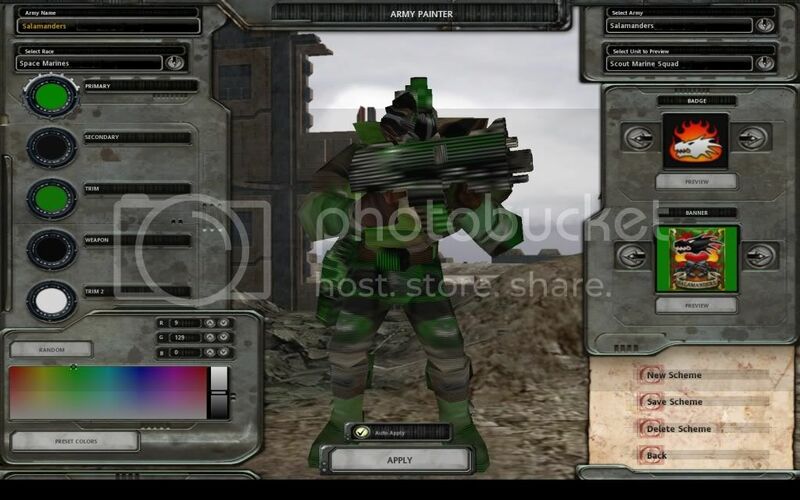 IIRC force_commander_unit_default.wtp is the texture used in Dawn of War. 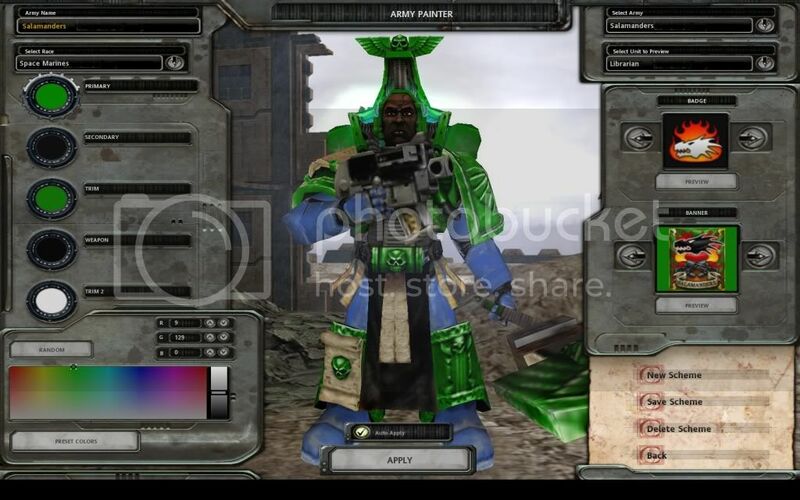 In Soulstorm (and Dark Crusade) he starts to get wargear and so rather than put the wargear on a new texture Relic just completely re-textured him. Try force_commander_tgd_unit2_default.wtp instead, or one of the other similarly named textures. Brilliant, thanks for the help ! Seems so simple now. Well this is my first attempt but i will share the result with you . The apothecary has become a bother as it uses the same section for both sides of the helmet and the salamander apothecary has red on the left and white on the right of the helmet. Just about all of the textures do that. It's the main reason why the Halved and Quartered Marines have solid coloured helmets! Unfortunately there are a few work-arounds like that which Relic took to fit things in the textures. It looks good for a first attempt. Most of the texturing is quite easy once you have the tools, you just need to have enough graphics talent to be able to pull off what you want to make. If it's just moving bits between colour layers (like a lot of mine was) then you don't need much talent at all! Whilst doing this i've noticed how horrible the vanilla scout marine texture is compared to the rest of space marine skins. Anyway i've cracked recolouring the original skins but I need to give them a bit more of a weathered look but it never comes out well.